Gabriel Mann music featured on Real World: Denver finale! Gabriel Mann's (C'95, Off the Beat) song, "When We Are One" is featured on the Real World: Denver finale. + Check it out here and click on the last section "Thank You, Denver". Gabe's music is featured for a full minute at the 8:00 minute markpoint (the clock counts down). + The music is edited a bit and unfortunately you can't hear the whole song. Click here for the unedited clip. 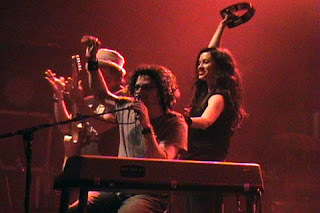 + Click here to check out Gabe's "ok alone" music video from his tour with Alanis Morissette in Europe. + Click here to check out other Penn alumni music. Also, tune in to the CW's new show Hidden Palms (Gabe's song "go up to go down" is in the july 4 episode, and "ride" (leadoff track from Gabe's new album!) is in the July 11 episode! First Video from Graduation 2007: Check it out! Alumni Weekend 2007: Class of 2018?